In the few weeks prior to the trip, I went on a shopping spree to prepare basic daily essentials like food, clothes, stationery, books, games and toys for my sponsored child, and also for the students and other children in the community whom we would be visiting. 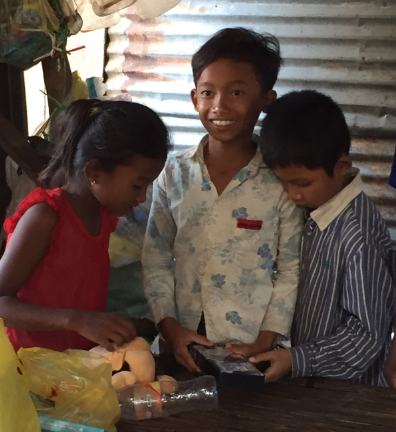 Our journey began with a 3.5-hour flight to Phnom Penh, followed by a rather bumpy 2.5-hour road trip to Takeo province, where the district of Kirivong is located. We were a motley crew of ten, from all walks of life and of varying ages. Interestingly, half the group were repeat trippers (i.e. they had made this trip to Kirivong ADP at least once previously), and the other half consisted of newbies like myself. 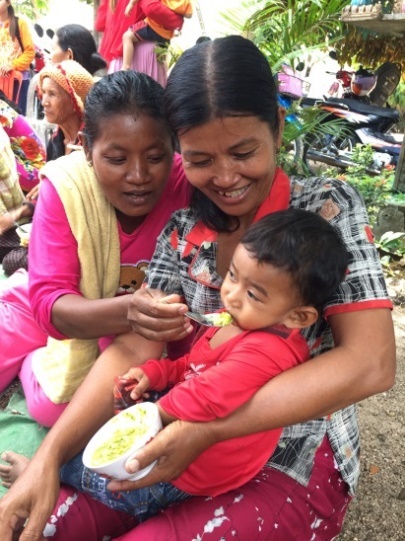 Visiting a nutrition centre where mothers and caregivers could learn how to make nutritious meals for their infant children, as well as basic hygiene practices. 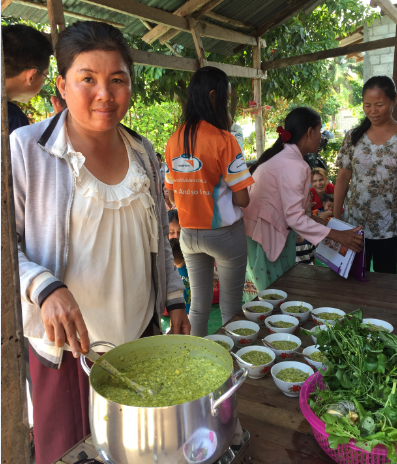 On the day that we visited, the menu consisted of green bean soup mixed with rice, which everyone seemed to enjoy. Interviewing health workers at a government-run health centre. 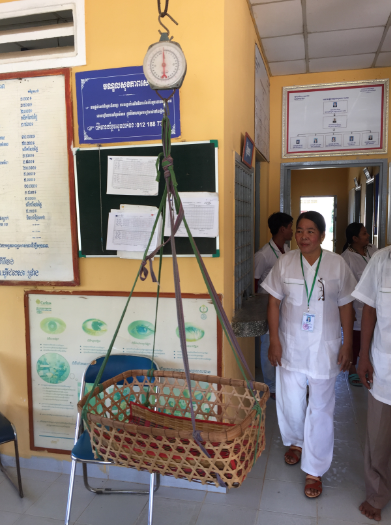 World Vision provides much-needed training to the government-appointed health workers to plug knowledge gaps about diagnosing the symptoms of, and treating, ailments such as malnutrition and diarrhoea in children aged 5 and under. 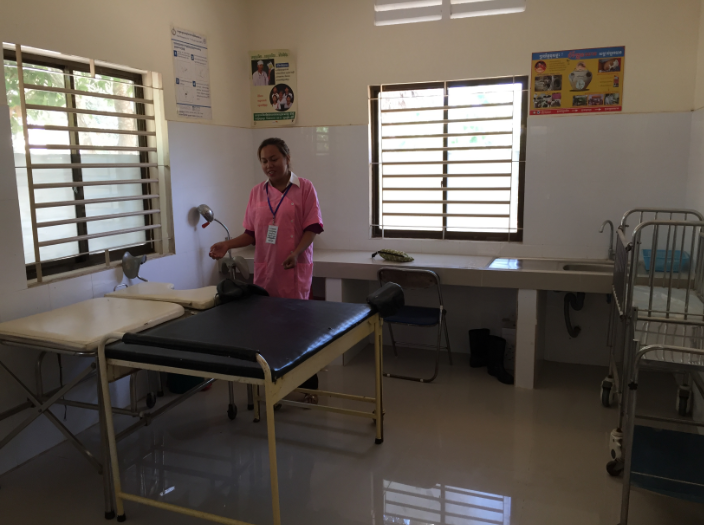 Community health volunteers have also been trained and mobilised by World Vision to raise awareness among the villagers about the availability of medical services for mothers and children at this centre. 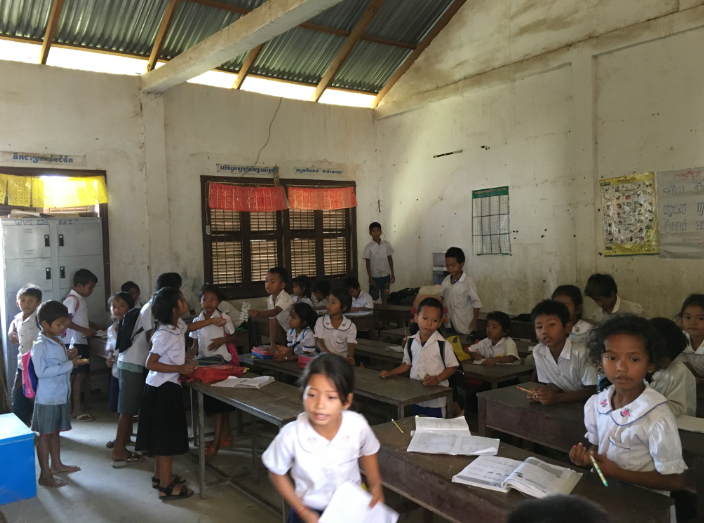 Interacting with children at a primary school supported by World Vision, where we saw the future of Cambodia in action! We observed students learning literacy skills with the aid of a package of interactive resources called Total Reading Approach for Children (TRAC). These resources included electronic tablets containing educational games, as well as complementary textbooks and card games. Younger students were paired up with older students who mentored their juniors in the use of these learning tools. 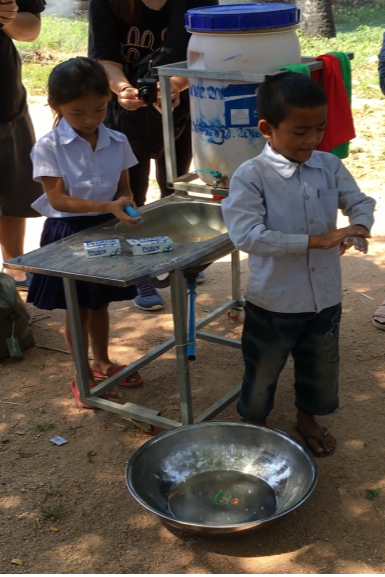 The students also learn about sanitary hygiene and other life skills with the aid of teachers equipped by World Vision. 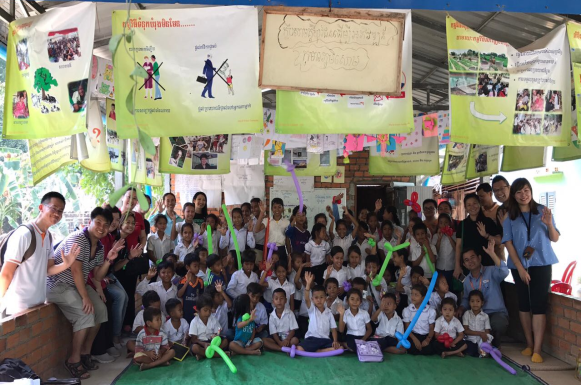 Visiting a Child Club which runs supplementary educational activities with the aid of community literacy coaches trained by World Vision. 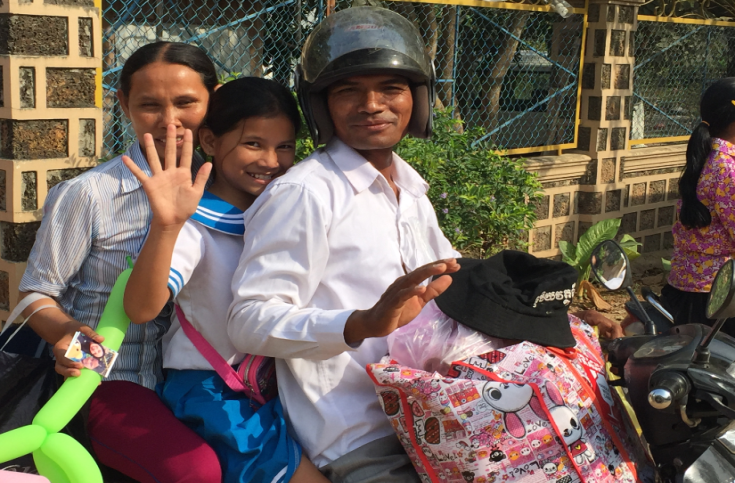 Here was another boost for Cambodia’s future. 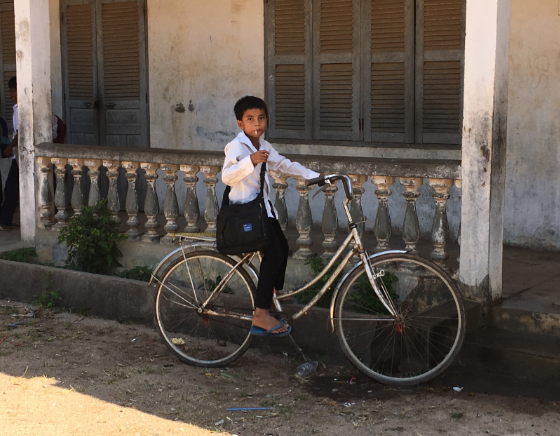 When we visited, we taught the kids English and they taught us Khmer. This was followed by a language contest. Khmer has 35 consonants and is a tough language to learn. The kids clearly outpaced us in the contest! Meeting with Most Vulnerable Families who had had to contend with very poor living conditions at different points in their lives. 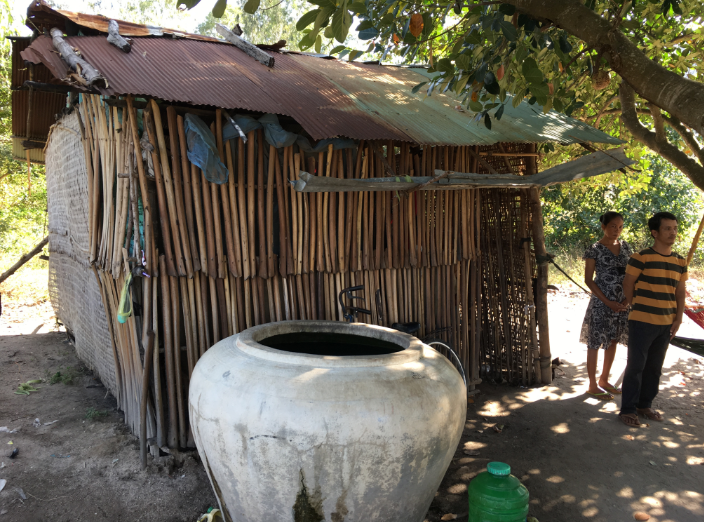 The first family we met was a single parent household that had since been lifted out of extreme poverty as a result of World Vision’s economic empowerment interventions, which had enabled them to run a small vegetable farm growing crops like chilli. 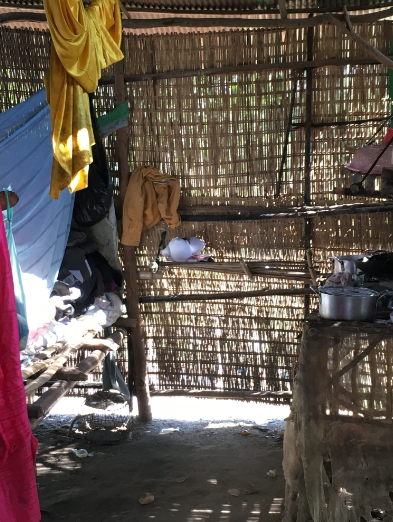 The second family we met had just begun receiving support from World Vision, and had had to live for many years in a makeshift house with limited space and no amenities such as latrines. 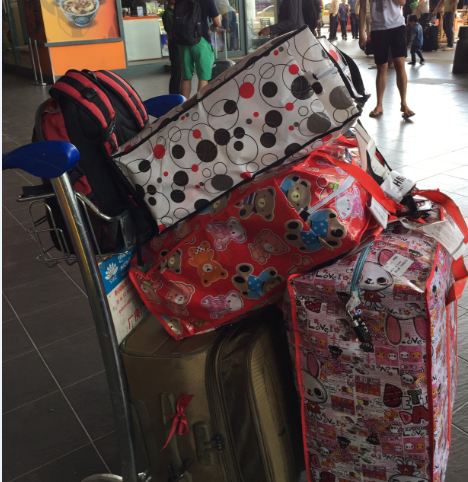 The repeat trippers in our group had cautioned us to not set our expectations too high for our first meeting with our sponsored child. 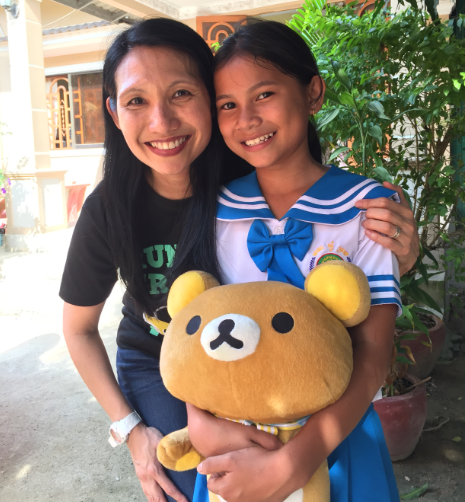 Based on their prior experience, many of the children typically started out being very shy and reserved as they had not had opportunities to interact with foreigners. 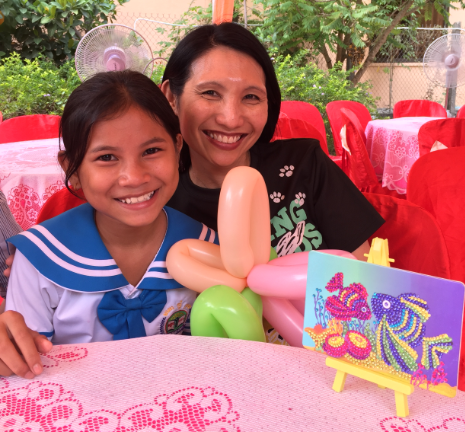 As such, I initially did not have any expectations for what was meant to be the biggest highlight of the trip: meeting with my sponsored child. After corresponding for a few years now, Chanrath and I finally met in person. There was so much to say, yet all we could do was to just smile at each other, hold hands and hug. 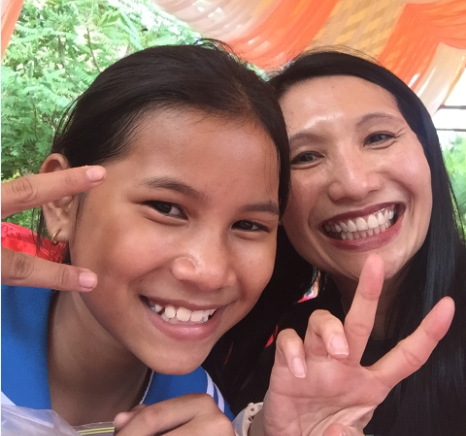 I was surprised that she was friendly and warm, had a loveable personality, and was rather chatty (in Khmer). She had so many questions she wanted answered, foremost among them being when I would come visit her again (multiple times!). 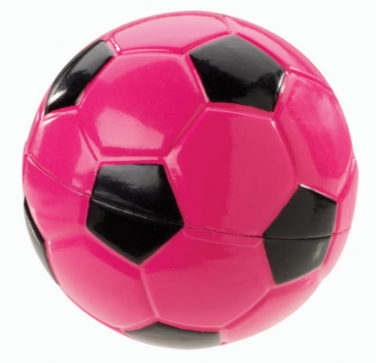 To inspire Chanrath to dream of possibilities without limitations, I gave her a somewhat unconventional gift for a girl – a pink football. Her initial reaction was a puzzled look. I explained to her that football is not just a game for boys. Like football, whatever the boys can do, so can she if she desires. She broke into a big smile. The sparkle in her eyes was confirmation for me that she understood, and that she was inspired and filled with hope. My wish for Chanrath is that she will grow up to be a successful young lady, for whom the world will be her oyster to conquer. I do not think anything could have prepared me for the feeling I felt when I saw Chanrath for the first time and the afterglow effects from that afternoon spent with her. I was overwhelmed with gratitude and appreciation. Indeed, as the saying goes, “for it is in giving that we receive”. This one’s dedicated to you, Chanrath… thank you for all that you have taught and given to me.